See how our client utilized RPR™ to conduct a 6 country, 35 payer TPP assessment in 3 WEEKS! At Market Access Transformation (MAT) we are committed to deliver unparalleled global payer insights to support our clients’ product’s clinical development and commercial strategies through our RPR™ platform, a revolutionary online platform for manufacturers to seek ‘on demand’ payer insight in a matter of days. In a recent survey, on behalf of a top-10 pharmaceutical client, MAT leveraged RPR™ to conduct a multi-scenario target product profile (TPP) assessment for a novel product in rheumatoid arthritis (RA) to accomplish a set of objectives. 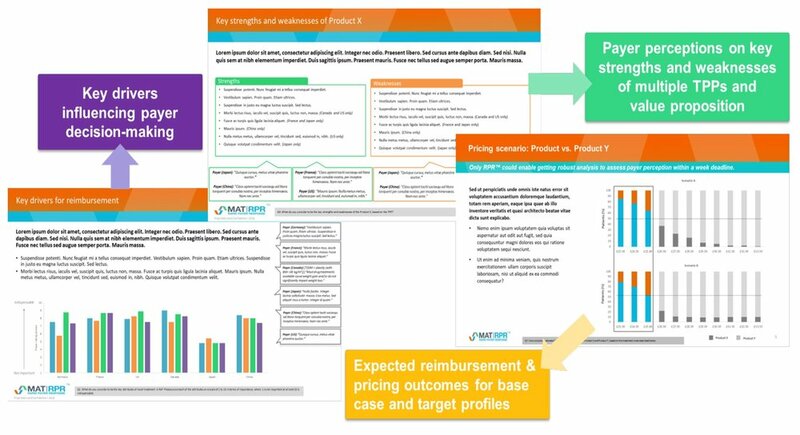 Only the RPR™ platform provides robust analysis to assess payer perception within a 3-week deadline allowing our client to identify and act on key market barriers/changes. Our dynamic survey-based approach enabled our client to further probe by asking clarification and follow-up questions. The RPR™ platform contains a project status module which provided the client with ‘real-time’ viewing of payer verbatims through the portal enabling the client and MAT’s market access experts to further probe by asking clarification and follow-up questions resulting in the most robust feedback.